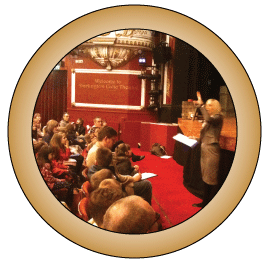 Above: Natalie talking to our lower school about the history of Darlington Civic Theatre. Many of them were particularly interested in the ghost stories relating to the theatre. After listening to Natalie’s talk our students were taken on a guided tour of the theatre. They got to walk into the boxes and were amazed when they realised that the view from the boxes was restricted. Natalie explained that when the theatre had been built the boxes were built so that the audience could see the people who were sitting in them. Those who sat in the boxes were far more concerned about people seeing them rather than if they had a good view of the stage. After the young people had been given a tour of the theatre it was time to eat. They all enjoyed eating their sandwiches before the show started. However as you can see from this picture Tom (left) seized the moment to discuss Bertolt Brecht (A German poet, Playwright and Theatre Director). It was great to see his persistence pay off when at the end of the ‘Swallows and Amazons’ performance many of the students in Tom’s class raised the question “was that piece of theatre in the style of Stanislavski, or Brecht?” They continued to have a conversation about it. Progress indeed! As you can see Paul got into the spirit of things a little too much! After the performance the groups were met by the Company Manager, Robin Longley who took the students on stage and showed them the set and props used for the performance. The students got to see the size of the wings at the sides of the stage. Robin explained how different parts of the set fly in for backgrounds and scene changes and the students were very interested in how everything worked behind the set. “Having read the book and seen the film of ‘Swallows and Amazons’ I had a preconceived idea of what I thought I was about to see. How wrong could I be? I think the best way to put it would be, “Don’t judge a book by its cover.” How right that statement is. The production was so much more than I expected, it told the story not only with musical delights, but was so visually pleasing, action packed and the script written in such a way that it was easy to follow. Here at Enter CIC we believe it is important that all our students are educated in the theoretical elements of theatre and performance, but that they can experience a practical and visual education with our educational theatre trips. The students gain an in depth knowledge of the workings of a professional theatre and of a touring company. This is a vital part of their learning experience with Enter CIC.